Efficient and sustainable infrastructure solutions to create urbanscapes that escape the ordinary. Finding the golden mean in urban infrastructure. Growing towns and cities need to both create new infrastructure and replace old. Finding the ‘sweet spot’ between simple function and noteworthy design is, in and of itself, a daunting task. Balancing symmetry, proportion and harmony with specific urban environments is taking it to another level all together. AIL’s Urbanscape Infrastructure Solutions offer progressive urban planners and landscape architects the opportunity to bring enhanced aesthetics to their projects with the confidence that they are making both fiscally-prudent and environmentally-responsible choices that will benefit their communities well into the future. And, speaking of impacts, our solutions have flexibility and resilience built in to withstand unexpected events like traffic overloads, extreme weather, flooding and earthquakes. 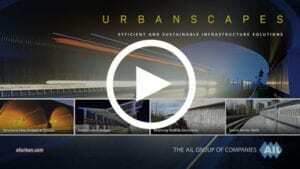 Contact one of our Urban Infrastructure Specialists at 1-506-364-4600 or info@ailurban.com. See the full range of our Urban Infrastructure Solutions for a wide variety of applications. green wallsPreserving and enhancing urban green space is important. Consider surrounding one of our Structural Plate Bridges or Tunnels with Green Walls created on battered, wire-faced configuration of our Vist-A-Wall MSE Structural Walls. Inherently sustainable and resilient, these economical solutions provide many decades of maintenance-free service. bevelled ENDSIf site geometries permit, bevelled ends are a very natural way to help a structure be one with the natural contour of the land. Sloped embankments can be left green or finished with natural stone. Any variety of architectural coping or collar treatments can be integrated to accentuate their gracefully-sweeping curves. PRECAST PANEL HALFWALLSThe architectural aesthetics of our Vist-A-Wall Precast Panel Headwalls can be extended to the inside by creating textured concrete halfwalls running the length of the structure. This hybrid design, effectively sets the corrugated metal structure on a raised engineered concrete foundation. END TREATMENTSOne of the most important facets of a Structural Plate Bridge or Tunnel are the Headwalls. With a limitless array of panel sizes, colours and textures, our Vist-A-Wall Precast Panel Walls help every installation make a statement. A custom mural wall could tell your community’s story with a sense of context and place. COATED OR COLOUREDOur Structural Plate Bridges and Tunnels are usually provided with a Galvanized or Polymer-Coated Finish and left that way for low-maintenance service of up to 100 years. However, they can also be custom-coloured to provide a brighter interior or to create unique artistic installations. With a little inspiration, the sky’s the limit! INTERIOR lightingBeyond safety and security, light can invoke feelings of peace, harmony and creativity. With today’s modern LED lighting technologies, light can be used to accentuate the structure’s geometry and create a welcoming and memorable experience for users. SIGNATURE BRIDGESA well-designed bridge is more than just getting from point A to B. It can make a real visual impact in any urbanscape. Starting with a wide variety of styles and truss types, our range of features and options is as expansive as the bridges themselves – colours, architectural accents, lighting, decking, railings, abutment treatments, and more. PEDESTRIAN BRIDGESMunicipalities and transportation authorities love our prefabricated Pedestrian Bridges because they can often be installed in hours, with local crews and equipment – saving time and money. And, working together, we ensure the results are anything but ‘pedestrian’. VEHICULAR BRIDGESChosen for accelerated construction, our Vehicular Bridges are available in modular or truss systems in a wide variety of designs, sizes and finishes. Add to this the flexibility of multiple decking options, sidewalks and architectural lighting, and you can create highly-tailored solutions for the most unique urban bridging applications. Urban areas often require retaining walls for bridge abutments, grade separations and transportation corridors. Our Vist-A-Wall MSE Structural Wall Systems are fast, flexible and economical embankment solutions that adapt well to curves, angles and steps – and look good while doing it. The extensive precast panel options with our Vist-A-Wall MSE Structural Wall Systems have creativity stacked in your favour. Choose from a wide variety of panel concrete types, sizes, textures and colours. Our custom mural treatments make truly distinctive statements. Lightweight PVC AIL Sound Walls are quickly becoming an important part of the urban landscape throughout North America — often replacing older wooden or concrete sound barriers. With a wide variety of colours and finishes, they can enhance any urban setting. AIL Sound Walls boast some of the highest technical sound mitigation ratings in the industry. They are also impervious to weather and, with smaller footings, they are easy to install in tighter urban sites. The Golden Ears Bridge crosses the Fraser River and establishes a vital corridor between Maple Ridge, Pitt Meadows, Surrey and Langley via a connecting 14 km road system. When City of Ottawa officials decided to increase their planned OC Transpo Articulated Bus Garage’s capacity from 192 buses to 252, they faced resistance from the neighbouring community.